There is good reason that premiums are rising in Obamacare exchanges 😷😷😷😷😷 insured individuals are spending way more on health care than is supported by the premiums being collected. And yes, it’s just that simple. Obamacare is built on an unsound foundation. The promise of affordable health care by way of affordable premiums was always an illusion. We use financial data reported by insurance companies to the National Association of Insurance Commissioners and compiled by Mark Farrah Associates to look at the average medical loss ratio (the share of health premiums paid out as claims) from 2011 through 2016 in the individual insurance market. The figures include coverage purchased through the ACA’s marketplaces and ACA-compliant plans purchased directly from insurers outside the marketplaces (which are part of the same risk pool), as well as individual plans originally purchased before the ACA went into effect. When medical loss ratios (MLRs) are higher, insurers are paying out more of their premium income on claims and – considering the relatively high cost of administering individual market plans – it is unlikely insurers can be profitable when MLRs exceed 85 – 90%. The loss ratios shown in this data note differ from the definition of MLR in the ACA, which makes some adjustments for quality improvement and taxes, and also do not account for reinsurance, risk corridors, or risk adjustment payments. Reinsurance payments, in particular, helped offset some losses insurers would have otherwise experienced. However, the ACA’s reinsurance program was temporary, ending in 2016, so loss ratio calculations excluding reinsurance payments are a good indicator of financial stability going forward. We also look at average monthly margins per enrollee over the same period. 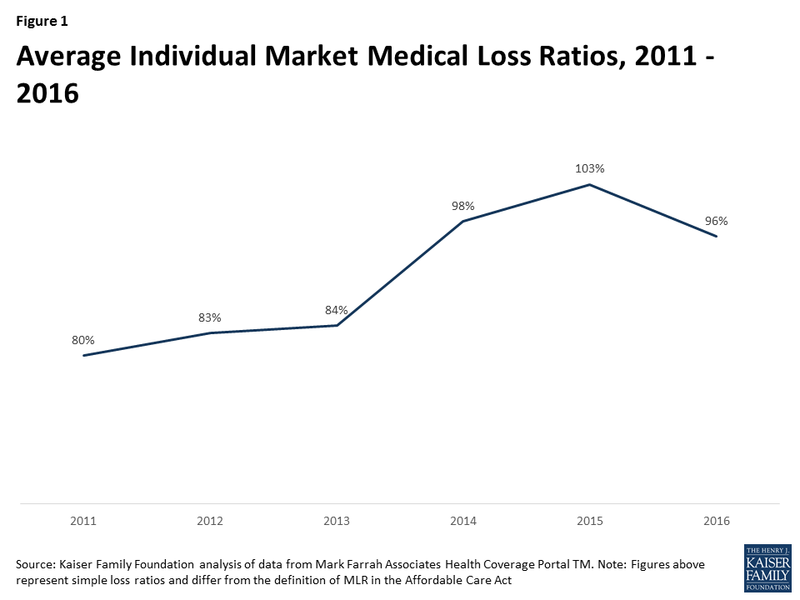 In 2014, when the exchanges opened and the bulk of the ACA’s market reforms took effect, individual market insurer financial performance worsened, with individual market MLRs averaging 98% compared to 84% a year prior. The individual market underwent a number of changes in 2014, and insurers had very little information to work with in setting their premiums. On average, insurers set premiums too low to cover their costs in the individual market. This mispricing is likely due to a combination of fewer young or healthy enrollees than initially anticipated, which was augmented by the late regulatory decision to permit some non-compliant plans to be retained, as well as some competitors apparently underpricing in an attempt to be competitive (low-cost silver premiums for 2014 came in substantially lower than CBO projections). In 2015, as claims growth continued to outpace premiums, individual market MLRs increased again, to an average of 103%. On the exchange markets, premiums remained relatively flat from 2014 to 2015, likely because insurers had not yet gathered enough data on their enrollees’ health care utilization to be able to set premiums more appropriately, and carriers were competing to be the low-cost option. Individual market insurers submitted their 2015 premiums to state and federal regulators in spring of 2014, shortly after the first ACA exchange open enrollment had ended. Some perspectives on health care costs are hard to believe.